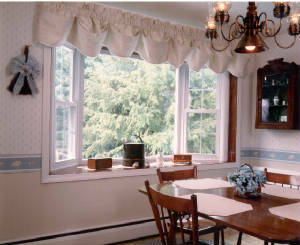 WeatherMaster Vinyl Window Systems is a division of Bonded Insulated Products, now a 4th generation family business. Since 1944, Bonded has manufactured thousands of vinyl and aluminum windows and storm doors for home owners in New Jersey and the metro New York area. Our clients are contractors and dealers who rely on a supplier to provide higher quality window products, built locally, on time delivery and attractively priced. Insulated Glass Repairs. Bring the failed or broken glass sash to us. New glass - no gimmicks - Same day repair. * require a longer lead time. Call office for details. The history of Bonded begins as a family owned business after World War II. Aware of energy conservation even then, blown-in mineral wool and fiberglass insulation into homes and businesses was the primary direction for the business. This portion of the business was sold in 1989 to concentrate on window and door manufacturing. The first practical and affordable aluminum framed storm windows arrived in the 1950’s. These were added to the product offerings to complete the conservation properties of the homes and businesses in northern New Jersey. 2-track storm windows with side expanders became obsolete in the mid 1950's with the design of 3 track tilt style storm windows. This style aluminum storm window remains in great demand. Designs have improved along with extrusion performance, hardware, energy improved glass and weatherstrip technology. Producing storm doors for the growing residential market, Bonded began marketing interchangeable insert styles along with jalousie and self-storing models in the 1960’s. The changeover from annealed glass to tempered glass in 1972 was accomplished easily. This legal change reduced the risk of severe injury by almost 100% and continues to this day. Among the first to sell an aluminum framed ratchet style replacement window with single glass, Bonded quickly joined in the manufacturing of aluminum replacement windows and the first mechanically assembled vinyl windows in 1972. Ongoing technology and new designs brought poured polyurethane thermal break aluminum frames into widespread commercial use in the late 70's and early 80's, eliminating the chance of condensation on the window frames. The early 80's saw great strides in vinyl technology, rapidly replacing aluminum as the material of choice for residential use. The 90's saw welded vinyl come in it's own as a better way to produce vinyl framed windows, but it wasn't until the millennium that welding technology, extrusion and polymer technologies caught up with each other, creating the new windows now available. Insulated glass production and warranties improved with technological breakthroughs in reactive sealants, warm edge glass spacers and pvc-composite profiles. 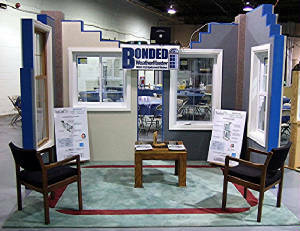 Bonded has been part of the growth in the window industry in New Jersey since 1944. Now the fourth generation has learned that performance through design is best, the cheapest isn't always the best way to go, service counts, innovation stands out and personal contact is so very important.